Back in the dim and distant past, I made a list of list of goals and aims for 2016 (I know - madness). One such goal was to visit more of the amazing places that are on our doorstep. It's so easy to plan visits to beautiful places while you're away on holiday while forgetting about the little gems right here at home. One such gem is Uppark House and Gardens. This is a National Trust 17th century country house and garden near Petersfield. Despite only being about 40 minutes away, it's somewhere I've never visited. You could say it falls into the 'we must go there one day' category as you drive past on the way to somewhere else. Well not this time. Armed with multiple cameras, good weather and a Mother with a birthday that needed celebrating we set off to explore. As with any good day out, we started the day with a cake and a cuppa. 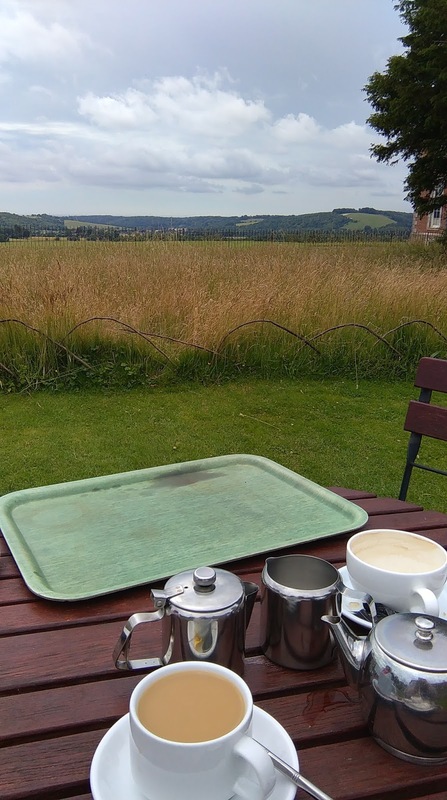 We arrived before the main part of the house opened so had plenty of time to sit and admire this view over the South Downs. From here you could see the channel, it was quite surreal sat drinking tea while watching the cross channel ferries and other shipping pass on by! The servants quarters and tunnels opened before the house, so we set about exploring them - carefully - those stairs were slippery! One of the reasons Uppark House is so well known is because of the devastating fire of 1989 which damaged so much of the main building. The amount of work to repair the house is incredible, looking at the before and after photos around the house, it's hard to believe it's the same house. The grounds were beautiful, with guided tours available if you like that sort of thing. Personally, we just preferred to amble around, discover hidden corners and generally be silly. We had such a lovely day here. Although National Trust properties can be expensive, you're pretty much guaranteed well kept gardens to roam around and beautiful properties to explore. It's kick started my aim to visit more of the local gems here in the south so keep a watch for more days out and silly poses!